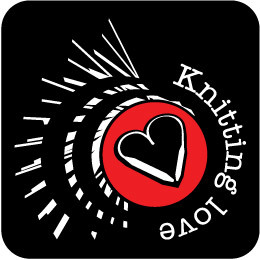 Knitting Love motif hand-printed on organic black shirts using flex foil by Shirts of Berlin. For other coloured shirts and tote bags please contact me! We all love knitting, no? I know I do. That's why I let everybody know! The text and the heart can be orange, neon orange, pink, red, yellow, dark or light blue, green, beige, glitter red or gold (the last two will cost 2 € extra). If you are looking for other colours or sizes of shirts, or tote bags, just contact me and let me know what you are looking for and I'll do my best to get exactly that to you! 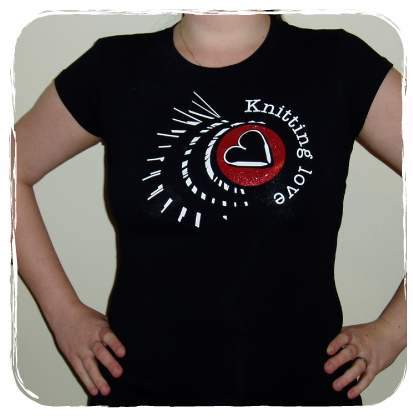 If you'd like to buy this knitting t-shirt just leave your email address in a comment and I'll get in touch with you. As all comments have to be approved by me before being published, your email won't be visible on this site at any point. The postage for these shirts is 2 e for Germany and 4 e for the rest of the world. If you buy more than one shirt the postage fees might change, but will of course be combined. You can use PayPal or pay by bank transaction to my EU bank account (this only works inside the EU).